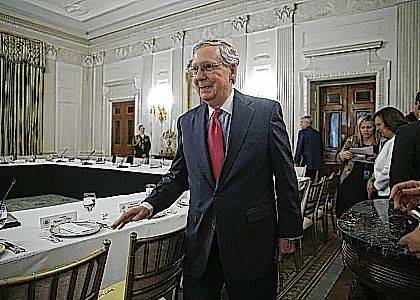 Senate Majority Leader Mitch McConnell of Ky. walks to his seat for a luncheon between GOP leadership and President Donald Trump on Wednesday in the State Dinning Room of the White House in Washington. Americans overwhelmingly want lawmakers of both parties to negotiate on health care, with only 13 percent supporting Republican moves to repeal “Obamacare” absent a replacement, according to a new poll. The poll was conducted as the GOP’s plan floundered in the Senate during the past week. A foundation for common ground seems to be this: Nearly everyone wants changes to the Obama law, while hardly anyone wants to see it abolished without a substitute in place. The Congressional Budget Office said Wednesday the GOP repeal of Obama health law without replacement means 32 million more uninsured by 2026. Republicans including President Donald Trump and Senate Majority Leader Mitch McConnell have recently pushed the notion of repealing as much of “Obamacare” as possible, then figuring out a replacement later. That’s not what the public wants, the poll found. Former President Barack Obama’s law extended coverage to some 20 million people, reducing the nation’s uninsured rate to a historic low of about 9 percent. But it was passed without a single Republican vote and has faced entrenched opposition ever since. The law’s private insurance markets are shaky in many areas, with premiums rising and insurers exiting due to financial losses. The law’s Medicaid expansion has worked more smoothly, but 19 states still refuse it, amid debates about costs and the government’s role in health care. Candidate Trump promised voters that repeal would be a slam-dunk, and that better, more affordable health care would take its place. Instead the first six months of his presidency have been consumed with fitful efforts to move GOP-only legislation. With McConnell lacking the votes to pass his overhaul in the Senate, or a straight repeal bill, the Republican campaign may be sputtering to an end. The AP-NORC poll suggests the debate over Republican plans actually may have nudged the nation toward the left on health care. In the poll, 62 percent said it is a federal responsibility to make sure that all Americans have health care coverage, a 10-point increase from just a few months ago. Thirty-seven percent said health care for all is not a federal responsibility, down from 47 percent in March. “When confronted with millions losing coverage, Americans are more supportive of the principle that the federal government should cover people,” said Robert Blendon of the Harvard T.H. Chan School of Public Health, who reviewed the AP-NORC findings. Indeed, 59 percent said they preferred leaving “Obamacare” in place over its outright repeal. The poll found a deep sense of unease over Republican plans. Thirty-seven percent said they or their families would be made worse off by the GOP proposals. That’s striking because the ACA covers only about 20 million people in a nation of more than 320 million. Part of the explanation may be that Republicans also proposed major cuts to Medicaid, and that could have increased public misgivings. Sixty-two percent in the poll opposed Medicaid cuts. Of major elements in the GOP plan tested in the poll, only the idea of allowing young adults to stay on their parents’ insurance until age 26 got majority support (65 percent). That’s a holdover from Obama’s law. Repealing Obama’s unpopular requirement that nearly all Americans have coverage or pay a fine got the support of 44 percent, while 39 percent were opposed. Allowing insurers to charge older customers higher premiums based on their age got the support of only 7 percent, while 78 percent were opposed. Among Republicans, 75 percent were opposed. Denying federal funds to Planned Parenthood was supported by 25 percent, while 57 percent were opposed. Among Republicans, 53 percent support denying Planned Parenthood funding. Overall, 51 percent of Americans said they were opposed to the Republican health care plan, while only 22 percent supported it. Among Republicans, not quite half were in favor, while 2 in 10 were opposed. Associated Press reporter Laurie Kellman contributed to this report.